Artist's illustration of a SpaceX Dragon capsule approaching the moon. SpaceX won't launch two space tourists on a mission around the moon in 2018 after all, according to media reports. "SpaceX is still planning to fly private individuals around the moon, and there is growing interest from many customers," SpaceX spokesman James Gleeson told the Journal via email. Dragon already flies robotic cargo missions to and from the International Space Station, launching atop SpaceX's workhorse Falcon 9 rocket. 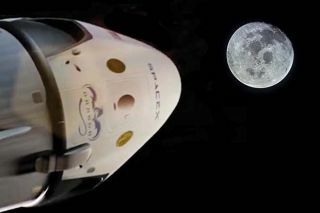 The company is working to get the crewed version of the capsule ready to go; SpaceX holds a multibillion-dollar NASA contract to ferry astronauts to and from the orbiting lab using Dragon and the Falcon 9. NASA had originally hoped that this astronaut-taxi system — and one being developed by Boeing, which also inked a commercial-crew deal with the space agency — would be ready to go in 2017. But progress has been slower than expected; SpaceX and Boeing are both officially targeting the latter half of 2018 for their first crewed test flights, but that milestone may slip into 2019. The reusable Falcon Heavy was still in development when Musk announced the around-the-moon mission, but the vehicle now has its wings. The giant rocket debuted in February in spectacular fashion, launching a Tesla Roadster carrying a mannequin dubbed "Starman" into deep space. And two of the three Falcon 9 first stages that make up the Heavy's first stage aced their landings back on Earth. The Wall Street Journal story requires a subscription; you can find the article here: https://www.wsj.com/articles/elon-musks-spacex-delays-plans-for-first-space-tourists-to-circle-moon-1528046708.